Disestablishing “Glacial Lake Speight”, New Zealand? 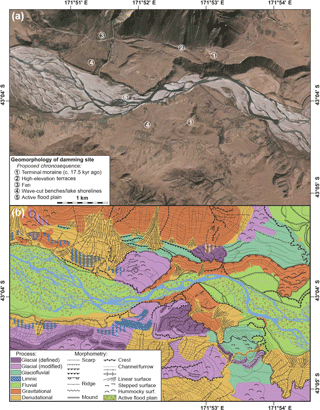 An example for the validity of detailed geomorphological assessment with the study of mountain glaciations Validity of detailed geomorphological assessment Stefan Winkler et al. Winkler, S., Bell, D., Hemmingsen, M., Pedley, K., and Schoch, A.: Disestablishing “Glacial Lake Speight”, New Zealand? An example for the validity of detailed geomorphological assessment with the study of mountain glaciations, E&G Quaternary Sci. J., 67, 25–31, https://doi.org/10.5194/egqsj-67-25-2018, 2018. Figure 1Elevation map of the study area (based on NZ Topo50 map data, Land Information New Zealand, https://www.linz.govt.nz/land/maps/topographic-maps, last access: 9 August 2018). The small insert shows its location within New Zealand and the red frame denotes the area covered by Fig. 3 (i.e. the potential damming site). The approximate outlines of “Glacial Lake Speight” are indicated by a stippled line and based on existing morphological evidence and the figure published in Gage (1958). Please note that the maximum lake level Gage quotes in his text (1550ft or ∼472.5ma.s.l.) matches neither the lake extent indicated in his own figures nor modern topographic data. Even if some inaccuracy may result from the topographic information Gage used at his time, the difference is quite considerable and “1550ft” is potentially a printing error (1750 or 1850ft (∼533 or ∼564m would result in a much better match). The middle Waimakariri River catchment in the Southern Alps of New Zealand, informally defined here as its reach upstream of Waimakariri Gorge to the junction of Bealey River (Fig. 1), is characterised by an outstanding assemblage of various landforms representing different processes of formation and ages. It offers ideal conditions for studying the sediment budget of a major New Zealand braided river within its mountain catchment. Such research has, however, not been carried out yet. It seems to be a legitimate hypothesis considering this catchment as part of a complex sediment cascade. Its numerous voluminous fans, impressive terrace sequences, and wide braided river floodplains are efficient sediment sinks. This would infer that substantial and efficient evacuation of sediment would rather take place under full glacial conditions during glaciations or in their wake, intensified by paraglacial processes, than under current (Holocene) conditions. 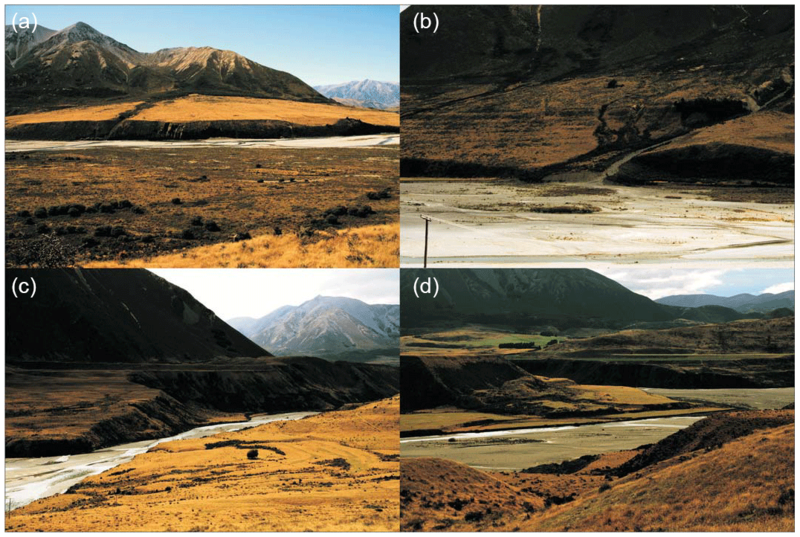 Detailed studies on the sediment budget may reveal valuable insights into the successive build-up of the Canterbury Plains and their modification by Holocene fluvial action connected to major braided rivers. Additionally, they bear implications beyond these fluvial aspects. Palaeoseismological studies claim to have detected signals of major Alpine Fault earthquakes in coastal environments along the eastern seaboard of the South Island (McFadgen and Goff, 2005). This requires high connectivity between the lower reaches of major braided rivers and their mountain catchments to generate immediate significant sediment pulses. It would be contradictory to the abovementioned hypothesis though. Obtaining better control on sediment budgets of braided rivers like the Waimakariri River will finally add significant value to multiple scientific and applied topics like regional resource management. An essential first step of sediment budget studies is to systematically map the geomorphology, conventionally in the field and/or using remote-sensing applications, to localise, genetically identify, and classify landforms or entire toposequences of the area being investigated. In formerly glaciated mountain environments it is also indispensable to obtain all available chronological information supporting subsequent investigations. In our case, only limited chronological and geomorphological information has previously been published. The first major geomorphological mapping was conducted by Gage (1958), who introduced a regional stratigraphy that is still in use today despite its lack of numerical age control (see Barrell et al., 2011). Rother et al. (2015) published new numerical (cosmogenic radionuclide) ages and improved our knowledge about Last Glacial Maximum ice extent and subsequent deglaciation. They, however, made no attempt to thoroughly assess Gage's geomorphological map. Except from a few studies merely addressing local topics, no work on a wider regional scale relevant for sediment budget studies has been published. The study area is covered in the glacial geomorphological map of Barrell et al. (2011), which primarily focuses on the chronological aspects of glacial landforms and lacks details due to its scale (1:100 000). 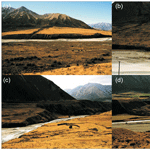 Figure 2Ground images of selected geomorphological features in the study area: (a) Binser Fan as seen from the opposite side of the valley; a sequence of shorelines related to the former lake is visible on its lower part to the right; (b) sequence of shorelines formed on the lower part of the prominent fan downstream from Binser Fan as seen from the opposite side of the valley; (c) overview of the proposed damming site (see text and Fig. 3) as seen towards the east; (d) slump at the confluence of Waimakariri River and Poulter River (entering from the left back) immediately downstream from the proposed damming site (all images Stefan Winkler: a 11 March 2018, b–d 13 March 2018). In his study, Gage (1958) introduced the so-called “Glacial Lake Speight” that temporarily occupied a large section of the middle Waimakariri River during deglaciation (Fig. 1). He named it after Robert Speight, a prominent Christchurch-based geologist who investigated glacial landforms and deposits of the region during the first part of the 20th century. Gage's concept of Glacial Lake Speight has been retained since (see Forsyth et al., 2008; Barrell et al., 2011; Rother et al., 2015). Geomorphological evidence in the form of palaeolake shorelines is evident, for example on the large alluvial fans (Fig. 2a, b, Supplement Sect. 3.8). Whereas the existence of this former lake remains unchallenged, already in early preparatory stages of our study the original concept of Glacial Lake Speight comes into conflict with our geomorphological analysis and mapping. We conclude that Glacial Lake Speight potentially has to become disestablished as a temporal lake formed during deglaciation and causally connected to it. Establishing a logical succession of landforms and related processes during landscape evolution reveals that the temporary lake that once occupied the valley must be younger, even without new chronological data. This inevitably requires revisiting statements of Gage (1958) regarding the lifespan of the temporary lake and proposed mechanism of its damming. Glacial Lake Speight and its chronological status is not a major focus of our general study; instead we aim to share our conclusions and put them up for discussion because (a) Glacial Lake Speight is a well-known concept within the regional Quaternary community that surely needs further reassessment, (b) it constitutes another example for apparently universally accepted key localities that might not hold up under detailed re-evaluation, and importantly (c) it demonstrates the unchanged value of basic geomorphological analysis and mapping despite recent technical and methodological progress. Figure 3(a) Orthorectified aerial photo of the proposed damming site (modified after Land Information New Zealand, https://data.linz.govt.nz/data/category/aerial-photos, last access: 9 August 2018). A few features mentioned in the text are indicated and set into a proposed chronosequence. (b) Preliminary geomorphological map of the proposed damming site covering the same area as the upper panel. The map has been prepared following the slightly modified mapping key of GMK 25 (see Leser and Stäblein, 1985) and some layers (including active processes) have been omitted for clarity. The two different signatures for glacial process area account for landforms of defined origin (e.g. moraine ridges) vs. areas that have merely been overprinted/modified. Different signatures for scarps, ridges, and channels highlight different dimensions (listed small to large here) as outlined in detail in the abovementioned mapping key (contours based on NZ Topo50 map data, Land Information New Zealand, https://www.linz.govt.nz/land/maps/topographic-maps, last access: 9 August 2018). Because of missing shorelines or lake sediments found downstream of the confluence of Poulter Valley, Gage (1958) concluded that the lake existed during deglaciation when the glacier retreated subsequent to the last major advance that formed terminal moraines in this section of the valley, the two-phased “Poulter advance” (ca. 17.5 ka according to Rother et al., 2015, using terrestrial cosmogenic nuclides). The inner of the Poulter moraines is located just upstream the abovementioned confluence (Figs. 1 and 3 and Fig. S4d, e in the Supplement). Gage (1958) suggested that this moraine and debris-covered stagnant ice dammed Glacial Lake Speight but provided no detailed mechanism or timeline. It extended up-valley as far as the Hawdon River confluence (Fig. 1). Among a few other sites, the prominent Binser Fan shows evidence in the form of palaeolake shorelines best described as wave-cut benches (Figs. 2a, S3.8d). Binser Fan and an adjacent fan to the east (Gooseberry Stream Fan; see Figs. S3.8a, b, c) should have been built up to their present height during the highest lake level according to Gage. This interpretation was repeated by Barrell et al. (2011) mapping this particular fan to be of (Latest) Late Otiran age (∼20–14.5 ka), whereas almost all other fans in the area are mapped as Holocene. Gage (1958) interprets the shorelines as signs of an intermittent lake level lowering and states that Glacial Lake Speight existed for hundreds of years. Draining to at least the present floodplain level should have been completed prior to final wastage of early Poulter advance stagnant ice downstream of the lake because the latter protected, according to Gage, glacial sediments east of the Poulter moraine from destruction during drainage (see Gage, 1958, and Fig. 2 therein). Finally, he sees a lower fan intersecting one of the abovementioned fans formed during lower lake levels and consequently judges post-deglaciation fan activity as insignificant. This original concept immediately creates difficulties with a chronological sequencing of the landforms present in the study area (see below and see Fig. 3). It seems unlikely that the massive Binser Fan fully developed in the short time frame between the former glacier retreating from this part of the valley and the palaeolake reaching its maximum water level. Furthermore, it infers that Binser Fan has been predominately inactive during the subsequent Late Glacial and the entire Holocene. This would be unusual in comparison to most other fans in the wider region. The large extent of the lake and its inferred period of existence would, furthermore, require a rather stable natural dam, somehow difficult to comprehend if stagnant ice was involved. To tackle these and other emerging discrepancies, several questions need to be addressed. (a) Where was the lake's “dam” located? (b) How did it form and what material did it consisted of? (c) When did the lake form and how long did it exist? (d) What was the mechanism of its outburst? Some of the questions raised above are easily solved. 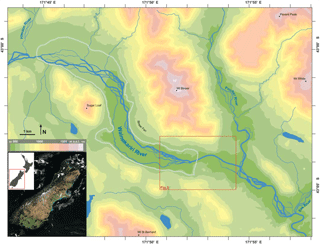 There are no features related to the palaeolake located downstream from the confluence of Poulter River. Although there is more than one suitable scar that could be related to potential massive landslides blocking the narrow Waimakariri Gorge further downstream (Figs. S2, S4f), the lack of any morphological evidence at the mouth and within the lower reach of both major tributaries, the Poulter and Esk rivers, rejects this hypothesis. Furthermore, the well-developed terrace sequences along Waimakariri River downstream of the Poulter River confluence (Fig. S3.4a) show no signs of influence by a temporary lake. The feature that once dammed the palaeolake needs, therefore, to be at the location Gage (1958) originally proposed. Because this location of the former natural dam cannot be separated from its origin and properties, the issue starts to become quite complex. There is no bedrock structure near the site in the Waimakariri Valley that could have acted as a dam (see S3.4). Given the glacial history of the valley and its occupancy by a large valley glacier during most of MIS 2, it would be hard to assume that a bedrock structure suitable to act as a dam during deglaciation would have survived many thousands of years of glacial erosion and then completely eroded since. Unlike large foreland lakes in the Southern Alps east of the Main Divide like Lake Ohau or Lake Pukaki, Glacial Lake Speight would not have occupied a glacial foreland depression supporting a permanent lake. While Gage (1958) draws such a comparison, both abovementioned lakes have natural outlets and are actually dammed by massive glaciofluvial fanheads and not any terminal moraine sequences. This is a fundamental difference from the Waimakariri River valley because such settings generally facilitate the occurrence of stable dams with established outlets. There is neither evidence for a postglacially infilled huge overdeepened basin in this part of the Waimakariri River valley nor does the setup of glacial, glaciofluvial, or fluvial landforms suggest such a basin existed. This requires any potential lake dam to be sufficiently stable to persist until the lake reached its maximum extent before it gradually collapsed or became incised and subsequently eroded. With the original timeline of Gage (1958), the natural dam needed to allow the lake to exist over many centuries, an assumption that sounds unrealistic for the terminal moraine he proposed, especially if debris-covered stagnant ice should have been involved. If the moraine actually constituted the dam, lake formation must have started immediately during the initial withdrawal of the glacier. It may theoretically include parts of the glacier tongue becoming separated from the active glacier and successively wasting down. But the moraine could only have acted as a dam if no efficient overflow existed from the onset. Increasing hydrological pressure by an enlarging proglacial lake is usually sufficient to widen and incise any meltwater overflow channel (in particular if stagnant ice becomes exposed) and thereby prevent any blockage upstream. With the distance of glacier retreat between the potential damming site and the confluence of Hawdon Valley of ca. 15 km (Fig. 1), it must have taken many centuries if compared to reported concurrent glacier retreat in similar valleys (Rother et al., 2014; Shulmeister et al., 2018). It seems, therefore, doubtful that the Poulter moraine and debris-covered stagnant ice could have provided a stable lake dam over such a long period without an existing depression and a supportive massive fanhead or similar feature. If the conclusions of Gage (1958) regarding Glacial Lake Speight are accepted, the Waimakariri River needs to have been incised at least a few metres below the lowest palaeolake shorelines prior to its formation. As soon as lake formation commenced and the former valley glacier left its position at the Poulter moraine, no further incision would have been possible. This theoretically could reintroduce the abovementioned hypothesis of an overdeepened basin upstream from the Poulter River confluence, but it becomes easily contradicted by the outline and profile of (glacio)fluvial terraces in comparison with the modern floodplain (see Figs. 3, S4c, d, e) and other geomorphological evidence up- and downstream of the damming site (e.g. truncated fans). Furthermore, the position of the Poulter moraine itself (Figs. 3, S3.1) would not match such a low valley floor level as two prominent terraces immediately proximal in high elevation (Figs. 3, S3.2) must have formed shortly after the glacier retreated. The terraces are located above the highest lake shoreline and thus need to be older. Binser Fan is a typical outsize fan (Jarman et al., 2011) characterised by an anomalous relationship between fan area (ca. 2.2 km2) and catchment area (ca. 3.4 km2). There is still discussion whether these fans are formed during rather catastrophic events or by gradual processes over longer periods of time. According to Gage (1958), the fan has been completely built up into the lake during its maximum extension. The palaeolake shorelines on the fan show an erosional character (S3.8) and are likely formed by wave action related to predominant westerly wind directions. The fan seems to be adjusted to a base level below the lowest lake shorelines close or identical to the modern valley floor. Erosion at the base of Binser Fan indicates subsequent shifting of Waimakariri's active river channel towards the east in this section of the valley (see S4c). Binser Fan and its two neighbours cover glacial features (kame terraces, glacially sculptured bedrock ledges) at their lateral upper margins (Figs. 3, S3.8e, S4c). From this morphological age relationship and process sequence, the fans presumably post-date any major glacial activity in the valley including initial deglaciation. Judging by comparison with other formerly glaciated mountain valleys worldwide, morphology and setting of the fans in the study area clearly indicate a postglacial formation, perhaps (but not necessarily) related to the paraglacial process system (Brardinoni et al., 2018). A Late Glacial build-up during the short time frame of the maximum lake level followed mainly by inactivity to allow preservation of the shorelines seems unlikely. The sedimentary architecture of the fan could be investigated using geophysical methods (e.g. ground-penetrating radar) to prove its non-deltaic formation into a lake. Barrell et al. (2011) mapped parts of the area north of the active river channel where Gage (1958) located the Poulter moraines as landslide. A landslide origin for the palaeolake, not necessarily related to deglaciation, would solve some of the abovementioned inconsistencies. Ground inspection reveals, however, that only a part of the terminal moraine complex has been post-depositionally covered by slope material (angular, clast-supported sediment mainly up to pebble grain size; see S3.3). There is no defined source area/scar of a larger landslide at the proposed damming site (S3.2) and both surface material and morphology of the terminal moraine complex are comparable to contemporary ones in other valleys (e.g. Borsellino et al., 2017). Even if we reject its capacity to act as a lake dam we have no doubt that the area constitutes a moraine system subsequently modified by glaciofluvial erosion and slope processes (Figs. 3, S3.1). However, its outline in relation to surrounding geomorphological features (in particular the two major proximal terraces; see S3.6) underlines our conclusion that the moraine itself cannot be considered a lake dam. Mass movements are very frequent in the Southern Alps. Many are supposed to be coseismically triggered (Davies, 2016) and the proposed damming site is in proximity to an active fault (Esk River Fault; see Forsyth et al., 2008). Mass movements have, of course, many various triggers and without a prominent landslide scar (see S3.2), the narrow active river channel enclosed by steep erosion scars cut into terrace flights itself moves into the focus. A major slump could easily mobilise enough material to block the narrow course of the Waimakariri River at this site. Successive incision during the latest late glacial or Holocene could have formed a steep-sided channel cut into glacial and glaciofluvial sediment of various origin and properties (see S3.10). Such sediment may not persistently support high cliffs if exposed to some form of external or internal forcing. A slump some hundred metres downstream of the proposed damming site (Fig. 2d) may constitute a miniature analogue for what happened at a larger scale at the narrowing. The proposed damming site is, furthermore, the only stretch within the valley where (glacio)fluvial terraces are not well developed (see S3.4a, 3.5a), instead cut by the abovementioned high erosional scarp (see Figs. 2c, 3, S3.7). How long would such a slump theoretically need to block the channel in order to dam the palaeolake to its mapped maximum size? Whereas the lake area can be estimated to ca. 24.5 km2 using existing morphological evidence and contours (Fig. 1), a detailed estimate of its volume is impossible. A generous estimate of 100 m average water depth would yield 2.45×109 m3 for its maximum level. The long-term annual average runoff for the Waimakariri River is ∼120 m3 s−1 near its mouth and ∼90 % of this runoff is estimated for it at the Waimakariri Gorge, which represents the mountain catchment (online data: https://www.niwa.co.nz and https://www.ecan.govt.nz, last access: 20 May 2018). Reducing the ratio to 60 % in accounting for three major tributaries (Poulter, Esk, Kowai) entering downstream from the proposed damming site, the modern annual average runoff volume would total 2.27×109 m3. Even if modern runoff data show high annual variability and are not representative for the past, the comparison reveals that filling the temporary lake to its maximum level would only take several years, even if its volume is hugely underestimated. The lake could, therefore, have been a short-lived feature that lasted as short as ∼10 or fewer years, quite comparable to landslide-dammed lakes that have been observed in the wake of recent earthquakes (Kaikoura, New Zealand). Consequently, after a comparatively short time an outlet could have formed and the lake successively drained. The multiple palaeolake shorelines show that drainage was not catastrophic but more gradual. Such a gradual process also argues for more coherent material of the lake dam and excludes, for example, debris-covered stagnant ice that may have been present in the valley during deglaciation. The latter would, once exposed, cause a sudden drainage. Recent experience at artificially dammed lakes (e.g. Lake Pukaki) demonstrates that shorelines form quite quickly in glacial and glaciofluvial sediments comparable to the ones at Waimakariri River (Bunting, 1977; observations by the authors). The likely short time frame provides another argument against Lake Speight's glacial origin. Geomorphological mapping and analysis conducted as an initial step towards a sediment budget study of the middle Waimakariri River has revealed serious doubts that a palaeolake that formed in the study area was temporally or causally related to the last deglaciation. Unless a convincing, detailed model of how the Poulter moraine and debris-covered stagnant ice could dam a lake of significant dimensions for many hundreds of years in the specific setting (i.e. without a massive fanhead and pre-existing basin) is developed, the previous concept of Glacial Lake Speight that stood unchallenged within the regional Quaternary geology for 70 years should consequently be disestablished. Any such model seriously considered requires, furthermore, to fit with the chronosequence and timescales of para- and postglacial landform development both locally and regionally, in particular with the dominating fans. We propose an alternative model for a comparatively short-lived temporary lake due to blockage by a major mass movement event during the latest late glacial or Holocene. Future detailed work on possible mechanisms and age constraints is highly encouraged. This is inevitably necessary to obtain better control on landscape evolution and effective process systems. Disestablishing the glacial context of former Lake Speight has implications beyond regional scale. It is an ostensive example that vigorous geomorphological analysis and mapping has inalterable value especially for the study of late Quaternary mountain glaciations. It reveals again that even apparently “established” concepts of key landforms or type localities occasionally have to be challenged. One has to accept that recent scientific progress within the field of dating techniques and palaeoglaciological modelling cannot compensate for what sometimes seems to be the gradual replacement of traditional geomorphology by “big data”. Ultimately, Glacial Lake Speight joins an increasing number of key localities that deserve to be re-evaluated and may no longer be carried on in their original interpretation. All data sources are publicly accessible online; supporting ground imagery can be found in the Supplement. The supplement related to this article is available online at: https://doi.org/10.5194/egqsj-67-25-2018-supplement. Barrell, D. J. A., Andersen, B. G., and Denton, G. H.: Glacial geomorphology of the Central South Island, GNS Science Monographs, 27, Lower Hutt, New Zealand, 2011. Borsellino, R., Shulmeister, J., and Winkler, S.: Glacial geomorphology of the Brabazon and Butler Downs in the Rangitata Valley, New Zealand. J. Maps, 13, 502–510, https://doi.org/10.1080/17445647.2017.1336122, 2017. 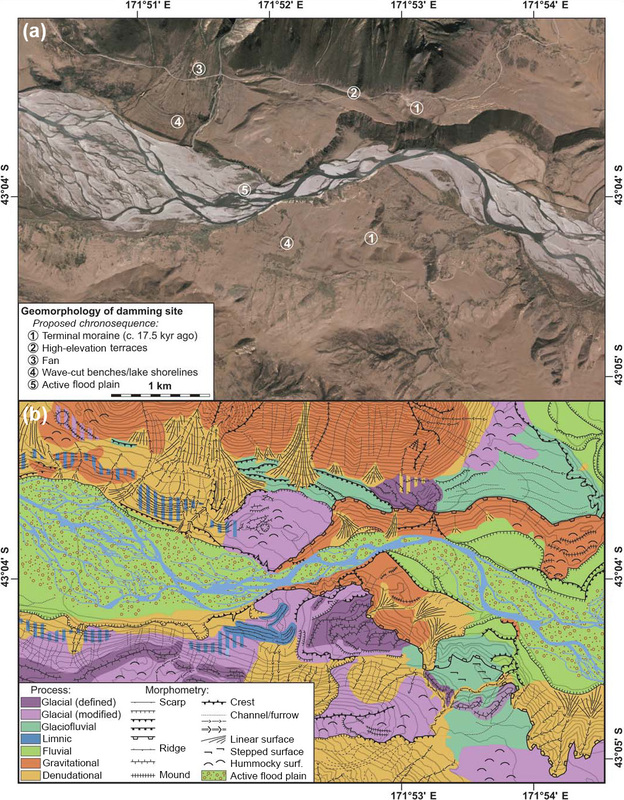 Brardinoni, F., Picotti, V., Maraio, S., Bruno P. P., Cucato, M., Morelli, C., and Mair, V.: Postglacial evolution of a formerly glaciated valley: Reconstructing sediment supply, fan building, and confluence effects at the millennial time scale, online first, Geol. Soc. Am. B., https://doi.org/10.1130/B31924.1, 2018. Bunting, D. G.: Lake Pukaki shore-line stability: a preliminary engineering geological investigation, Unpublished MSc thesis, University of Canterbury, Christchurch, New Zealand, 1977. Davies, T. R. H.: Mountain process geomorphology: Conceptual progress in the Southern Alps, in: Landscape and Quaternary Environmental Change in New Zealand, edited by: Shulmeister, J., Atlantis Press, 205–233, 2016. Forsyth, P. J., Barrell, D. J. A., and Jongens, R.: Geology of the Christchurch area, GNS 1:250 000 Geological Maps, 16, Lower Hutt, New Zealand, 2008. Gage, M.: Late Pleistocene glaciations of the Waimakariri Valley, Canterbury, New Zealand, N. Z. J. Geol. Geophys., 1, 123–155, https://doi.org/10.1080/00288306.1958.10422800, 1958. Jarman, D., Agliardi, F., and Crosta, G. B.: Megafans and outsize fans from catastrophic slope failures in Alpine glacial troughs: the Malser Haide and the Val Venosta cluster, Italy. Geol. Soc. Spec. Publ., 351, 253–277, https://doi.org/10.1144/SP351.14, 2011. Leser, H. and Stäblein, G.: Legend of the geomorphological map 1:25.000 (GMK 25) – fifth version in the GMK priority programm of the Deutsche Forschungsgemeinschaft, Berliner Geographische Abhandlungen, 39, 61–89, Berlin, Germany, 1985. McFadgen, B. G. and Goff, J. R.: An earth systems approach to understanding the tectonic and cultural landscapes of linked marine embayments: Avon-Heathcote Estuary (Ihutai) and Lake Ellesmere (Waihora), New Zealand, J. Quaternary Sci. 20, 227–237, https://doi.org/10.1002/jqs.907, 2005. Rother, H., Fink, D., Shulmeister, J., Mifsud, C., Evans, M., and Pugh, J.: The early rise and late demise of New Zealand's last glacial maximum, P. Natl. Acad. Sci. USA ,111, 11630–11635, https://doi.org/10.1073/pnas.1401547111, 2014. Rother, H., Shulmeister, J., Fink, D., Alexander, D., and Bell, D.: Surface exposure chronbology for the Waimakariri glacial sequence in the Southern Alps of New Zealand: Implications for MIS-2 ice extent and LGM glacial mass balance, Earth Planet. Sc. Lett., 429, 69–81, https://doi.org/10.1016/j.epsl.2015.07.033, 2015. Shulmeister, J., Fink, D., Winkler, S., Thackray, G., Borsellino, R., Hemmingsen, M., and Rittenour, T.: Evidence for slow late-glacial ice retreat in the upper Rangitata Valley, South Island, New Zealand, J. Quaternary Sci. 185, 102–112, https://doi.org/10.1016/j.quascirev.2018.01.006, 2015.